The following is a reflection by Liz Hadley, World Relief Employment Specialist. Names have been changed for privacy. I brought a handful of daffodils to dinner–ones I had picked from the side of the rode en route to the apartment. I wanted to bring something to celebrate. I knocked on the door, offered my handful of flowers and a hug to my friend, and then watched as her youngest child teetered around the living room. “She’s walking now!” I thought. The first time I had heard about this little one, she was mere months old, in hiding, and living far from her mom. Our dinner tonight is a birthday dinner of sorts. Sayida calls this day her “new birthday”: it’s the day she was granted asylum and her life started over. A year ago, I remember seeing her in our office for the first time. I had heard of a female asylee from Afghanistan being released from the Immigration Detention Center in Tacoma…and then I met her in front of the copier and fax machine. She was strong and relieved, but also anxious. 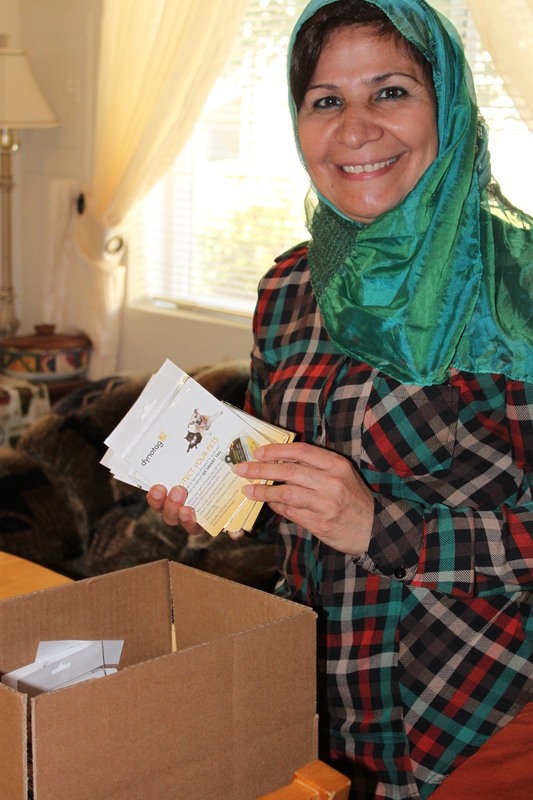 I remember holding in my hands the threatening letters from the Taliban that were posted on Sayida’s door back home. I remember her telling me that while in detention, she prepared her own asylum case by telling her story to an Iranian woman who translated it into English for a Congolese woman who then wrote it down in English. All three of them were awaiting their court hearing, all three of them believing in one another. I remember crying with her as she told me how old her children were, how they had to split the children up for safety, and how the youngest one should still have been nursing. I remember I couldn’t tell her if or when her family would be able to come. Today I sit at their American-style dinner table and smile at how her husband, Mustafa, is patiently feeding the little one and leaning over to laugh and ask Sayida (again) what I’ve just said. And I’m in love with the joy and positivity of their journey. When I took her to her first job interview, she explained to the manager that she was an engineer in Afghanistan and had worked on water projects to help women in her country grow vegetables. I was so proud of how she communicated her own strength and story. I remember bringing her a roll of bread while she worked her way through the company’s AutoCAD interview test…she hadn’t eaten all day but was intent on showing the company what skills she had to offer. And this interview turned into an internship, and the internship turned into a job, and now everyday she carpools with two other Afghans to work with the engineering team. In the Fall I remember meeting her for coffee near her workplace and asking about an update…any news on her family? Nothing yet. And I remember the text I received 2 months ago that read “I have good news. My family visas issued” and then a week later a picture of all of them together at the airport. I met her at our office by the copier and fax machine again, but this time everything was different. Her 1 year old in her arms and the older two in tow, she introduced me to Mustafa: the man who had supported her engineering work all along, who had phoned her to tell her it wasn’t safe to come back to Afghanistan, who had cared for their children while she sought asylum, and who had waited nearly a year to be all together in safety. And now at dinner Mustafa pulls out a stack of old photos for me to riffle through–small memories of their life before–he practices the little English he knows, and laughs with his children who are all learning to be siblings again. He cares for the two youngest while Sayida goes to work during the week and he’s prepared us dinner tonight. When I ask him how things are, he tells me “America is good!” with a laugh and a smile. We talk about how much a year has held – how much has happened to their family. Today marks a year of freedom for Sayida, but only a mere 2 months for her family. “But everything is good, thanks God” she tells me as she pours tea and reminds me that I can sleep on the couch tonight since Seattle is so far away. I decline the couch surfing option but take the tea, and thank God also for the strength and joy this family has given me. This entry was posted in Client Spotlight, Detention Center Ministry, Reflections, Refugee Employment on May 9, 2017 by World Relief Seattle. Our Women’s Sewing Class offers a safe space for women to learn English, foster community, and develop skills. Watch stories of mutual transformation from women in the class in this video. One of the main challenges that refugee women face when they arrive in America is learning a new language. That task becomes exponentially harder if they are pre-literate and don’t know how to read and write in their native language. As a result, many of these women find it incredibly difficult to learn English and venture out into their new surroundings, making them one of our most vulnerable and isolated populations. World Relief has partnered with Hillside Church and local volunteers to provide a dedicated sewing and childcare space and to create an 8-week basic sewing and vocational English language class. The sewing class not only provides these women with marketable skills, but it’s also a space for them to find community and practice relevant English skills. The first class was a great success. Eight participants met with our volunteer teachers to create weekly projects ranging from oven mitts to small purses. The women were also given the opportunity to create two baby blankets for future refugee families in need. As a result of the class, two women were hired by local companies. Future classes have become so popular, there is now a waiting list to enroll. In light of the inaugural class’ success, World Relief plans to offer this class again beginning on May 2nd. Our goal is to further develop and improve the curriculum to best meet the needs of the participants. Click Here to learn how to Volunteer in the class. We want to upgrade to new sewing machines for the class. New machines will enhance the students’ learning experience and allow them to practice on a wider variety of materials. This entry was posted in ESL, Refugee Employment on April 13, 2017 by World Relief Seattle. For two years Abdulrahman, his wife Zeena and their baby daughter waited for this phone call: the news that after fleeing their home country of Iraq they would finally be coming to the United States to start their new lives. For Abdulrahman, this is the ticket he was waiting for to get started on all of his dreams he had spent the last two years thinking up. From the time he was young, Abdulrahman idolized the American soldier as his childhood hero. He began hanging around Americans from the time U.S. troops started patrolling the streets of Baghdad. By the time he was 17, he applied to work as an interpreter for the U.S. military. Ultimately rejected for the age requirement, he applied again and was accepted on his 18th birthday. He spent the next four pivotal years of his life working alongside Americans in combat situations, learning U.S. military culture and ethics. In his words, “They taught me so many things. They helped make me who I am today.” Following his years of service to the U.S. Abdulrahman pursued a degree in Law. Integrating his experience of American culture with his Iraqi community was difficult. Finally, on the day of his final exams to complete his degree, his family was threatened, and forced to flee to Turkey for safety. He could not finish his Law degree after nearly four years of investment. His undeniable intelligence and refusal to give up on making something of his life motivated him to search for new dreams. He capitalized on the opportunity to work in a pharmacy, teaching himself medical terminology by reading the labels on pill boxes. When granted passage to the U.S. he came with the intention of pursuing education and a career in the medical field. While Abdulrahman can jive with the best of them in American slang and lingo, medical vocabulary is a different story. 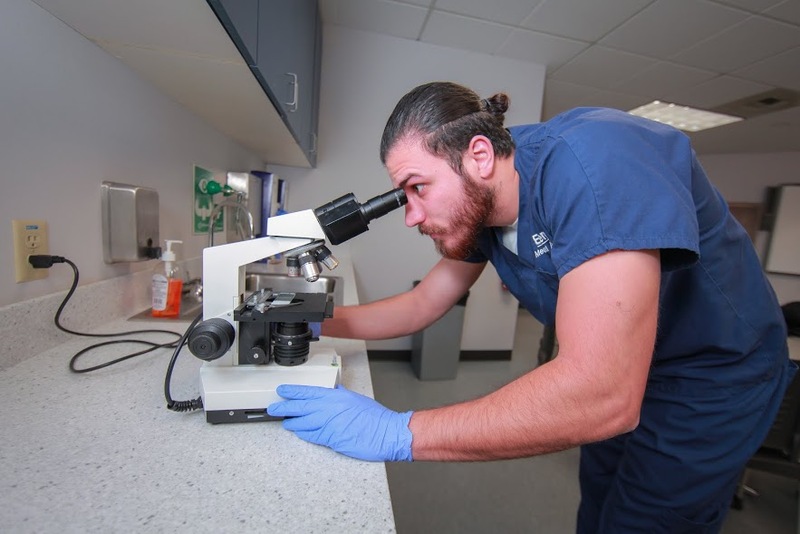 And yet, immediately after his arrival he began a certification class as a CNA and less than two months later had enrolled full time as a Medical Assistant student at Everest College in Renton. He now utilizes his phone and Google translator to interpret unknown words and concepts from English to Arabic during class lectures. He spends extra time at home memorizing words and definitions in English while simultaneously learning the concept in Arabic. 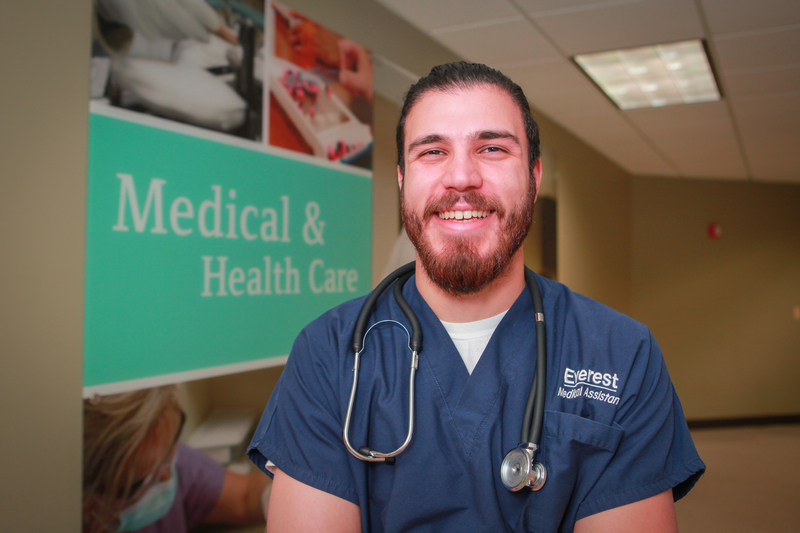 When asked about his studies he notes, “Demonstrations and clinicals are easy for me.” Textbook assignments are twice the work. 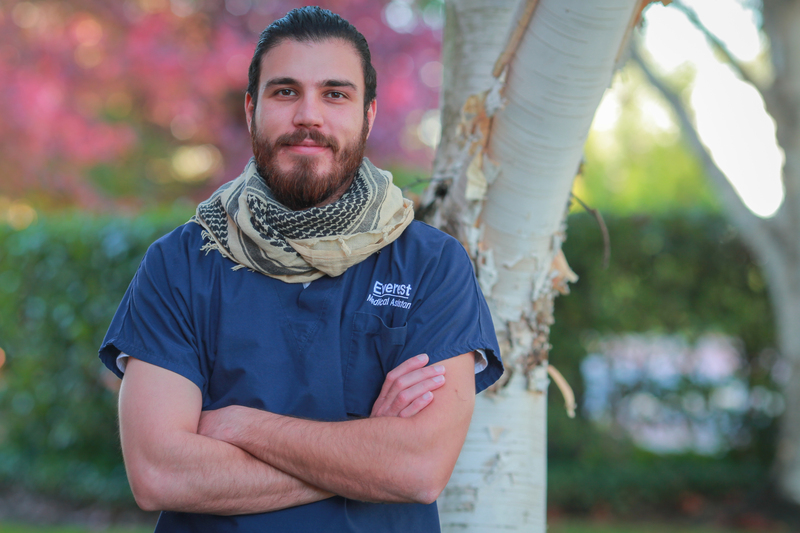 Abdulrahman came with a clear vision of what he wanted to accomplish when he came to the United States. He was not naïve in thinking it would be easy. Like anyone else new to the country, he has faced definite challenges that come along with confronting a new culture and place so different from your own. As Abdulrahman says, from a lesson he learned while working with the U.S. military, “Put yourself in the hurricane and be a part of it. Stay calm and don’t freak out.” In the midst of a whole new world that is swirling around you, Abdulrahman advises all newcomers to the U.S. to have a dream. Stay motivated! It’s not easy, but not impossible. Unforgettable moments of joy await! This entry was posted in Client Spotlight, Refugee Employment on October 30, 2015 by World Relief Seattle. These were the words that came to mind when Abbas tried to compare his first job in the US to his previous job as an interpreter for the US Army in Afghanistan. Abbas arrived in the US just months ago as part of the United States SIV program, granting refugee rights to individuals who’ve worked with the U.S. government and military in Afghanistan. “My previous job put me at risk… [now] I feel safe.” While the contrast between his new and former employment are just one example of the many changes facing people experiencing resettlement in a new country, Abbas has found stability and community in his new job. 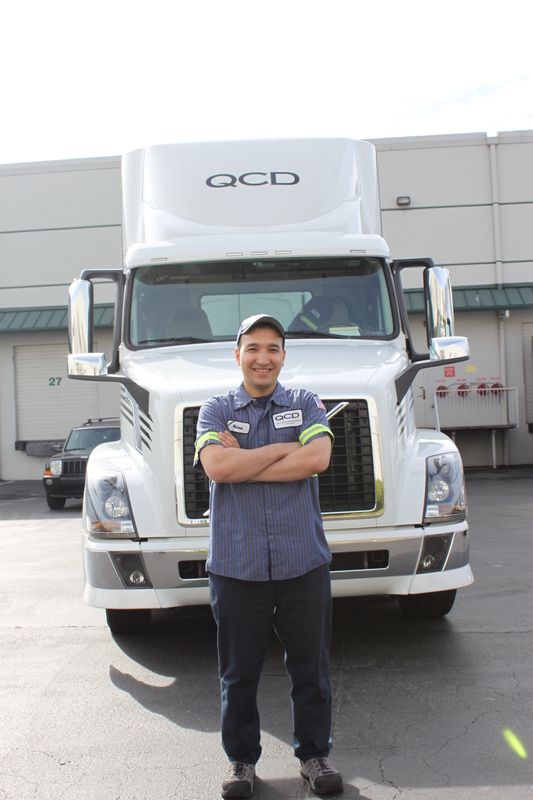 Abbas works as a Driver Helper for Quality Custom Distribution Services, delivering supplies to Starbucks locations throughout King County. He prides himself on having memorized the specifications of each box in the truck, enabling him to load and unload as efficiently as possible. 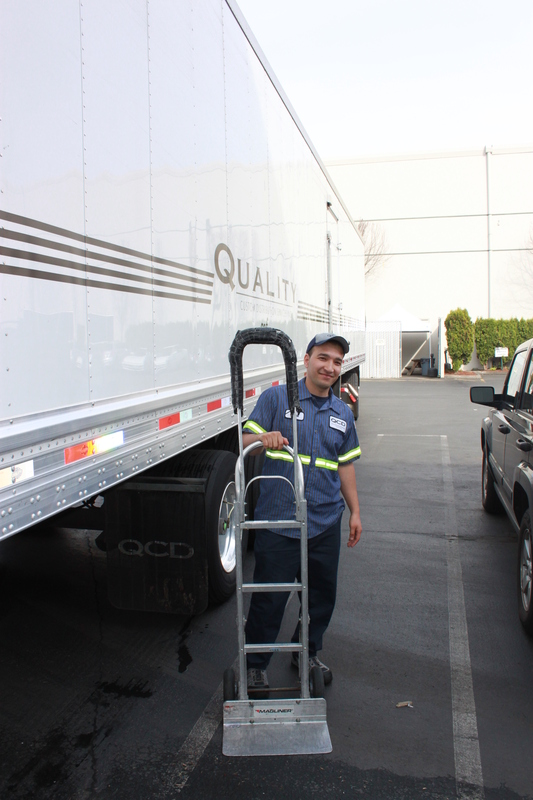 It’s no wonder why drivers at QCD request Abbas to be their ride along helper. Abbas has enjoyed the opportunity his job has provided to become familiarized with the city, improve his English through interaction with coworkers, and most importantly, get settled in his new life in America. “I don’t want to go anywhere else,” he says. Abbas’ new job did not come without challenges. The bus schedule did not align with his graveyard shift, requiring that he wait more than 2 hours after finishing work for the bus to arrive. Abbas stuck it out, and fortunately World Relief was able to donate a car to Abbas and his family to ease his commute. His exceptional work ethic and success as a team player has paved the way for further job placements for refugees at QCD after him. For Abbas, the difference between his former life and newfound community in the US can best be described as, “like Earth and sky.” While there are certain challenges awaiting all newcomers to the US, Abbas advises, “Don’t quit. Keep going. Be patient with the job.” Stability and hope are sure to come. 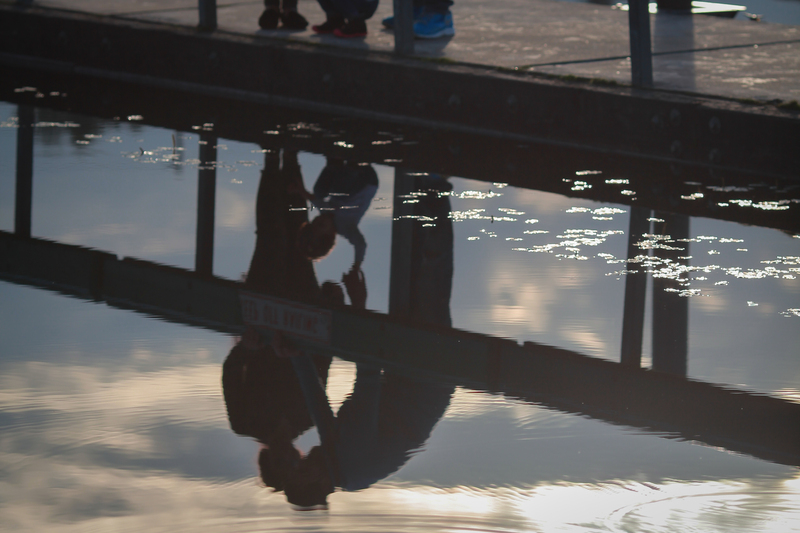 If you are interested in learning more about how you, your family or your church can come alongside refugees, we have a seminar series happening in Seattle at University Presbyterian Church June 3rd, 10th, and 17th. This entry was posted in Client Spotlight, Refugee Employment, Seattle, Uncategorized on May 26, 2015 by World Relief Seattle. These words of encouragement from Come Zee, a recently-resettled Burmese refugee at World Relief Seattle, are not surprising. She is full of positivity and optimism, and her bright smile cheers any room. After meeting her, you just know that she is going to be successful in whatever endeavors she pursues. 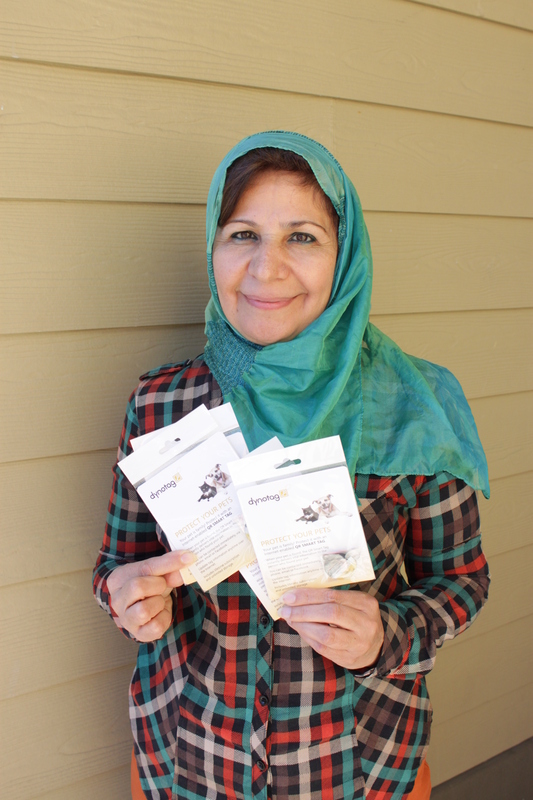 She arrived to the United States in July 2014 by herself, and joined friends who had already been resettled to south King County. After just over two months of faithfully attending English and job preparation classes at World Relief, Come Zee found a job and started working at Real Foods, a food production company located in Kent, WA. Again, it wasn’t surprising to learn that Come Zee had become a production lead just two months after she was hired in the production department. She says that being a lead is like doing a double job – she has to be very careful while labeling and completing paperwork or else the products they work with may be recalled. Her accuracy and sense of responsibility are a tremendous asset to the company. “I love my job,” Come Zee says. It’s a short commute from her home, and she is able to save money, especially with her promotion to lead. Her work schedule is flexible, so she plans to go back to school to improve her English skills after she gets her driver’s license. After spending 17 years in a refugee camp in Thailand, Come Zee recognizes that the life she now lives would not be possible had she not had the opportunity to come to the United States. As a refugee in Thailand, she was limited in mobility, education, and employment opportunities – all of which she now has access to in her new community. When asked about how she would encourage other recently-arrived refugees, she had quite a list to share. Encourage yourself. Know who you are. Focus on what you imagine your future to be like, but do your best in the present. Come Zee, we are thankful for your example, and hope for the very best for you! 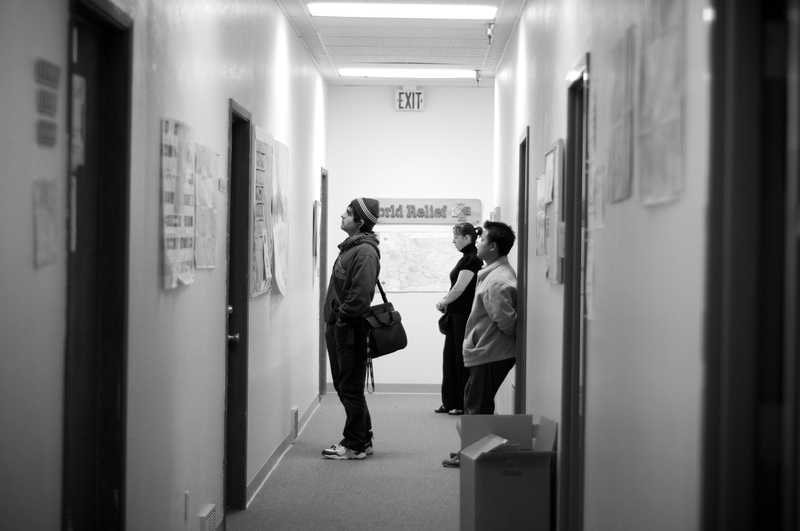 This entry was posted in Client Spotlight, Refugee Employment on March 13, 2015 by World Relief Seattle. The sun was shining brightly as students from Canyon Park Junior High in Bothell pulled into the World Relief parking lot on Martin Luther King Day. The culmination of a weekend of service opportunities, these CPJH students came down to Kent to participate in a city-wide clean-up with recently-arrived refugees and asylees at World Relief. 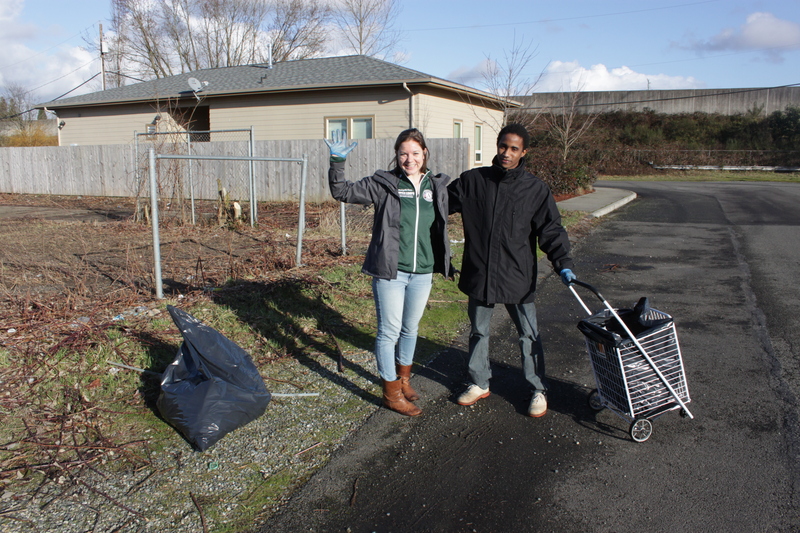 The students and World Relief participants carpooled over to the Interurban Trail, gathered trash bags and safety gloves, and set out collecting garbage along W Meeker Street through downtown Kent. Empty bottles, bits of plastic and paper, gloves, food wrappers, and a tire rim were among the items that began to fill our bags. One volunteer’s bag got so full that we had to leave it on the path and collect in when we returned to the park! 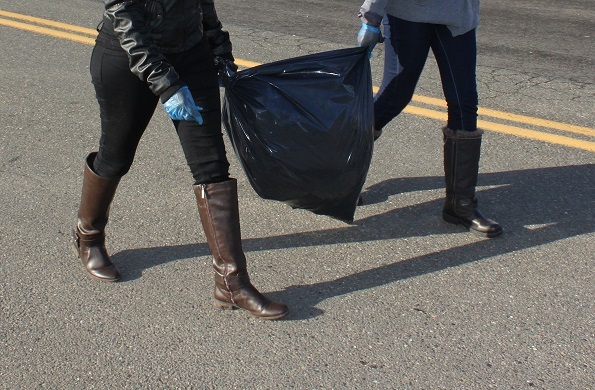 After collecting what felt like hundreds of pounds of garbage, we headed back to the World Relief office, washed our hands, and gathered in our conference room. With a generous pizza donation from Naked Pizza, students and World Relief participants shared about their hobbies, life experiences, and culture over a delicious pizza lunch. The common theme to the question: “Why did you come to the service project today?” was to meet people and give back to the community, a notable response for the World Relief participants who have only been a part of the community for a matter of weeks. What a blessing it is to have such engaged students and recently-arrived residents in our community! Now announcing: 2015 SEA-TRI-KAN Ride for Refugee Employment! This summer, join World Relief Seattle in cycling from Seattle to Tri-Cities to Spokane to raise support for resettled refugees working toward self-sufficiency. The 400 mile journey across the state is from June 17th-21st, and discounted early registration is open now. Information sessions will be held in North Seattle, South Seattle, and Kent next week. Are you in? Visit World Relief Seattle’s website worldreliefseattle.org or contact Caitlin at 253-277-1121 or cwasley@wr.org for more information. Ride for Refugee Employment: SEA-TRI-KAN from World Relief Seattle on Vimeo. This entry was posted in Refugee Employment, Uncategorized, Volunteer on February 6, 2015 by World Relief Seattle. When Mary Jochum, Director of Business Development for Dynotag, a local technology start-up, asked me about this possibility, a flood of job seekers came to mind. 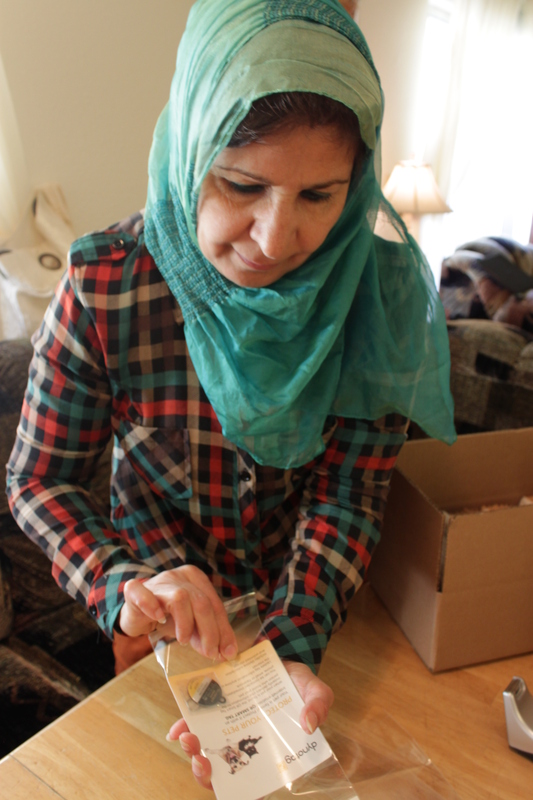 In-home, part-time work is an ideal option for some World Relief job seekers. If one spouse has a job, a family has young children at home, or a job seeker has physical limitations, performing light work at home can be an ideal option for building work experience and earning supplementary income. Our Employment Team identified four qualified candidates and took them to the Dynotag offices for interviews. 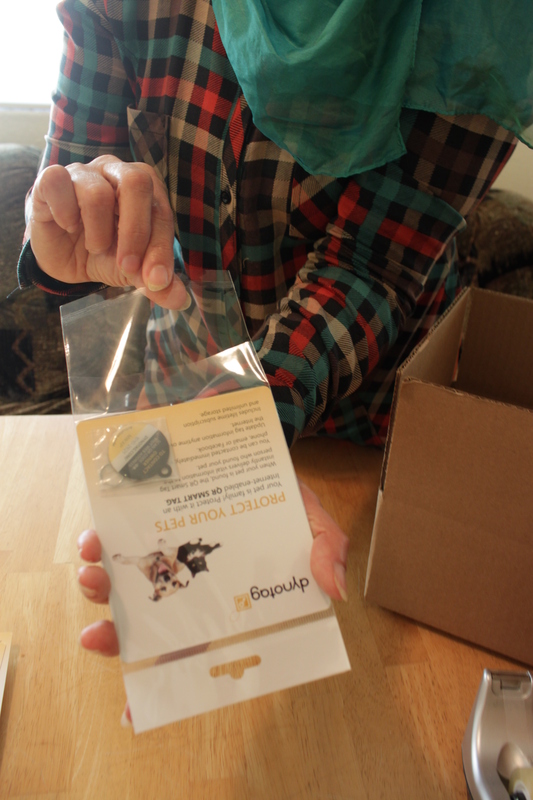 Two were selected and began working part-time in the Bellevue office, packaging various Dynotag Smart Tag products. After a few weeks, the new employees were up to speed and began taking the packaging work home. Once again, it’s a win-win for the World Relief Employment Program. While newly-arrived refugee job seekers gain experience and earn income, a local employer gains excellent employees. Thank you, Dynotag, for your continued support of World Relief Seattle! Learn about Dynotag at http://dynotag.com – and check out their product line assembled by WR workers at their online store at http://store.dynotag.com. For more information about hiring refugees in the Seattle area like Taghreed, go to worldreliefseattle.org/employarefugee/. This entry was posted in Client Spotlight, Refugee Employment and tagged employment on September 17, 2014 by World Relief Seattle. 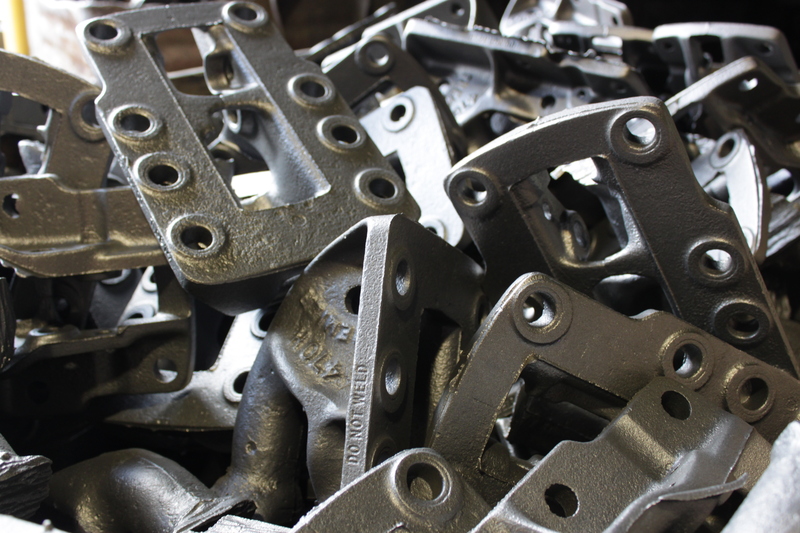 A foundry is a factory where metal gets melted down and poured into molds or casting to create an entirely new shape. There is a foundry in South Seattle where that process happens day after day, and a man from halfway around the world plays his role in transforming that metal into something new. Abdelmajid arrived to Washington with his family of four a little over a year ago. They fled their home country of Sudan, an area that has been in the news a lot over the past several years as it continues to heal from the ethnic cleansing in 2003 that displaced 2.7 million people from the region of Darfur. Part of that healing meant the creation of the world’s newest country South Sudan, which has also been the scene of terrible clashes that have displaced people in the recent months. The staff at North Star Casteel are more than happy with Abdelmajid’s work performance. He is never late, works fast, learns quickly, and is a great team worker. Since he started in 2013, Abdelmajid has moved up through three different positions because, as he himself puts it, his managers see him working hard and working safely. His excellent work ethic led to these job promotions. 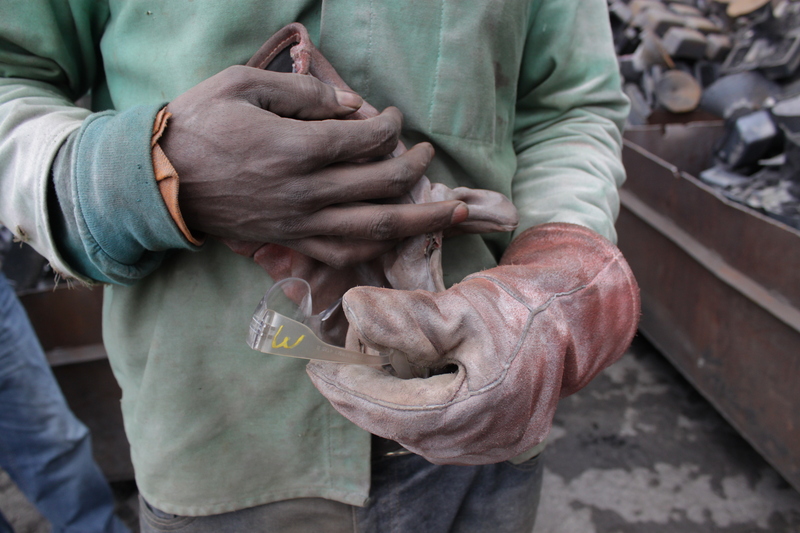 Abdelmajid acknowledges that working at a steel foundry is not an easy job. It’s hot and dirty, and can be dangerous as well. “It’s hard, but I like it,” He says. It’s a good job that he has thrived in since his first day. He hopes to keep learning and growing with the company, and maybe even become a supervisor one day. 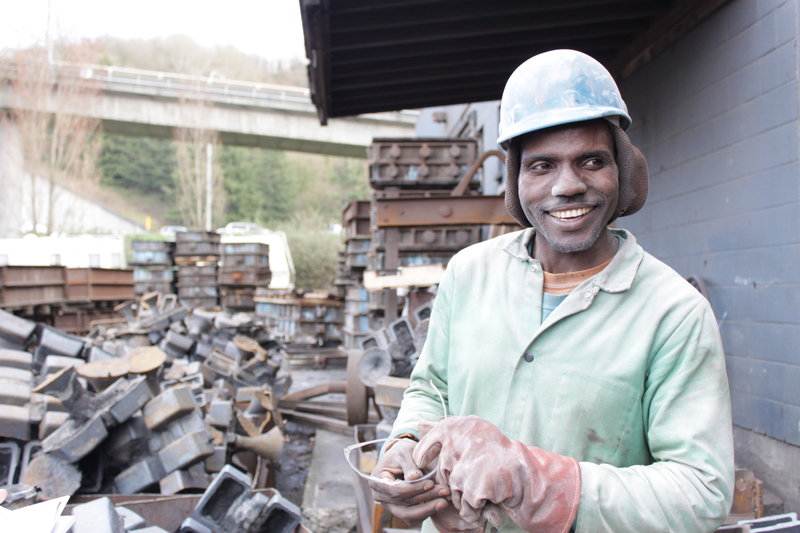 The transformations that take place here are not simply metal being formed into something new, but workers like Abdelmajid are also being reshaped here as well. For more information about hiring refugees in the Seattle area like Abdelmajid, go to worldreliefseattle.org/employarefugee/. This entry was posted in Client Spotlight, Refugee Employment on July 22, 2014 by World Relief Seattle.